Caption slip reads: "Photographer: Miller. Date: 1951-09-02. Reporter: Cowles. Assignment: Abraham Kroll. 31: L-R: David Letts, United Air Lines Pass. Agent, helping Abraham Kroll, 98, off of plane. 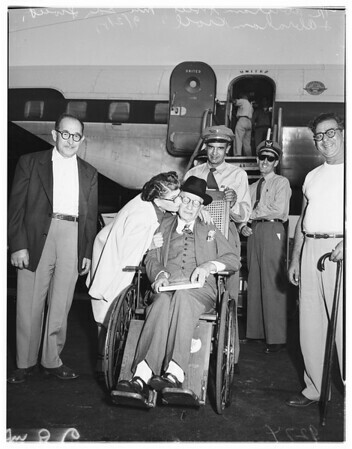 32: L-R: Mrs. Ida Sweet, Abraham Kroll, 98, and Jack Kroll at airport. 25: Abraham Sweet, Mrs. Ida Sweet, Abraham Kroll, Jack Kroll. 26: L-R: Abraham Sweet, Mrs. Ida Sweet, Abraham Kroll. (It was Kroll's first trip to California and first by air)". Edits: "Toby Nestler, 14, Kroll's granddaughter who made trip with him".